On one of our morning bay swims, I met a swimming coach who noticed my daughter’s love of the water. I was standing on the beach, shivering as I tried to warm up after spending 30 minutes in the 60-degree water. But Clara continued to frolic in the water for another half hour, porpoising around, splashing, doing handstands, and just swimming wherever she felt like going. The coach suggested Clara might like to read this book, so I got it from the library and read it myself before giving it to her. Grayson is named after the whale she met, which was 18 feet long, had become separated from its mother and was following Cox dangerously close to the shore. 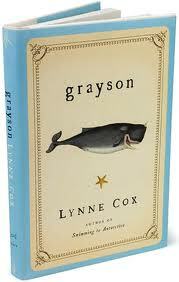 So Cox swam further out, guiding the baby whale, who she names “Grayson,” while looking for his mother. Along the way, Cox encounters schools of flying fish, grunion, leaping tuna, bat rays, sea turtles, garibaldi, jellies, and a playful pod of dolphins. She swims by an oil-drilling platform and talks to fishermen in their boats. She free-dives deep into the crystal-clear water of the Pacific, far from shore, and describes the many changes the colors go through as she descends. She floats on her back and thinks. She tries talking to the whale by imitating its strange clicks and grunts. As she describes the ocean and the things she finds there, she drops in little asides about how much power thoughts have, how they radiate out and create other thoughts, and how as a result it’s important to have positive thoughts. She’s trying to help the whale, and she understands she needs to think optimistically as well as swim strongly. Just 17 at the time, Cox was already an international-class swimmer, having broken records crossing the English Channel and the Catalina Channel. So her abilities to swim for long periods in 55-degree water, in open ocean, are quite a bit greater than most of us. It’s clear her mental and moral training has been strong too. I was hoping some of that confidence, and positivity, would sink in while Clara read the book. But mostly I was hoping she would see how comfortable in the water a good swimmer could be, and how looking at the ocean, and gazing into it, and paying attention to it could open up vistas of beauty and mystery and life. I don’t know if she got all that. But when she finished reading it, and I said it had to go back to the library, she told me she wanted a copy of her own to keep. Originally published on The Scuttlefish.